A landmark report on the future of cycling in Britain calls for a national cycling champion (similar to position occupied by Andrew Gilligan in London) to lead a drive for 10 per cent of all journeys in Britain to be by bike by 2025. More of the transport budget should be spent on supporting cycling, at an initial rate of at least £10 per person per year, increasing as cycling levels improve, says the report by British Parliamentarians. The report of the influential All-Party Parliamentary Cycling Group (APPCG) inquiry ‘Get Britain Cycling’ also calls for 20mph speed limits to become standard in urban areas and lower speed limits on many rural roads. It also says that all children should be given the chance to learn the skills of road cycling, at primary and secondary school. 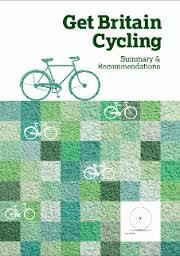 The group’s report, which was published on 24 Apr 2013 follows extensive public evidence from over 100 individuals and organisations, including the London Cycling Campaign. It is both possible and necessary to expand the role of cycling in the nation’s transport and social life, says the group. This will lead to reduced congestion, environmental benefits and improved health. The aim is to increase cycle use from less than 2 per cent of journeys in 2011, to 10 per cent of all journeys in 2025, and 25 per cent by 2050. For this to happen leadership is needed from the very top, the report concludes which calls on the Government to appoint a National Cycling Champion to advocate for cycling across all departments and externally. An e-petition calling on the Government to implement the recommendations is here. Please sign the petition and ask your family and friends to sign it too. Ensure local and national bodies, such as the Highways Agency, Department for Transport (DfT), and local government allocate funds to cycling of at least the local proportion of journeys done by bike. Cycle spending that makes a tangible contribution to other government departments, such as Health, Education, Sport and Business, should be funded from those budgets, not just the DfT. Revise existing design guidance, to include more secure cycle parking, continental best practice for cycle-friendly planning and design, and an audit process to help planners, engineers and architects to think bike in all their work. The Highways Agency should draw up a programme to remove the barriers to cycle journeys parallel to or across trunk roads and motorway corridors, starting with the places where the potential for increased cycle use is greatest. Local authorities should seek to deliver cycle-friendly improvements across their existing roads, including small improvements, segregated routes, and road reallocation. The DfT should approve and update (where) necessary new regulations, such as allowing separate traffic lights for cyclists and implementing Part 6 of the Traffic Management Act 2004. Extend 20 mph speed limits in towns, and consider 40mph limits on many rural lanes. Improve HGV safety by vehicle design, driver training, and mutual awareness with cyclists; promote rail freight and limit use of HGVs on the busiest urban streets at the busiest times, and use public sector projects to drive fleet improvements. Strengthen the enforcement of road traffic law, including speed limits, and ensuring that driving offences – especially those resulting in death or injury – are treated sufficiently seriously by police, prosecutors and judges. Offer widespread affordable (or free) cycle training and other programmes to encourage people of all ages and backgrounds to give cycling a try, as evidenced by NICE. The Government should produce a cross-departmental Cycling Action Plan, with annual progress reports. The Government should appoint a national Cycling Champion, an expert from outside the DfT. Central and local government and devolved authorities should each appoint a lead politician responsible for cycling.